What’s more appetizing than Spam? Spam nuts! The Hamakua Macadamia Nut Company makes a bunch of different flavors of macadamia nuts: Black Peppah, Butter Garlic and Herbs, Hula Jalapeno. But really, the only flavor you need to know about is Spam. That’s right. Spam mac nuts. Go nuts, Spam people! Guess what? 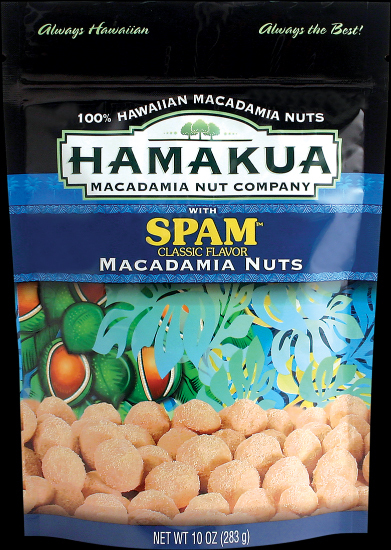 The Spam Macadamia Nuts are in stock. Also available in a Spam Gift Set. PSA: Also available on Amazon, but it is less expensive to get them directly from the company in Hawaii. Plus,then you can add some “peppah” nuts to your order to wash down (or burn away) the taste of Spam!